What’s up with Manny Villar? 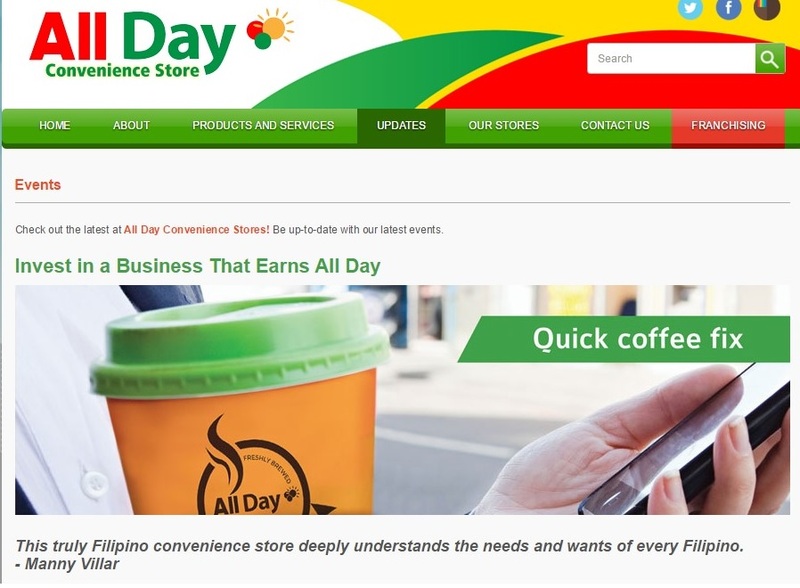 One of my favorite Filipino entrepreneurs just won’t stop! Yes, Mr. Manny Villar, the former senator is once again doing what he does best, expanding his business empire. From real estate to shopping malls and foundations, his passion for business seems to be unquenchable. Last year he launched his chain of All Day Convenience Store, strategically located at his properties and this year he announced his plan to venture into building hospitals. I won’t go further about the details but the thing is as the years pass by, I feel more convinced that he is a man to be admired and I feel vindicated for voting for him in the last presidential race. I first admire Manny Villar when he graced our graduation rites (PUP batch May 2005) as the guest speaker. That was 5 years before the presidential election in 2010 wherein I actively campaigned for him. One thing to know about me, I’m hardly impressed by anyone but Villar, yes he impresses me. FOR ME, he could have been a good president. Let me put it to the extremes, he could have paved the way for an LKY-transformation. He could have treated Philippines as his very own company which needs to be improved, enhanced and expanded. He could have used all his talents, skills and knowledge as a businessman for the betterment of the country and its people. Had he become the president, he could have built public hospitals instead of private ones. One may argue that presidency is not a business but a public service but believe you me, a public official especially the president needs serious business and leadership skills if he has to conquer national poverty. He could have been a great, if not the greatest president of this country. Yes, call me a loyalist if you want or if that’s what you call someone who studies, researches, follows and truly believes in a person’s capability, potential and cause. But, I am never a blind follower. I said, HE COULD HAVE BEEN AND OF COURSE HE COULD HAVE BEEN NOT. That’s a 50-50 chance but I was willing to take that “calculated” risk back when I voted for him last 2010. 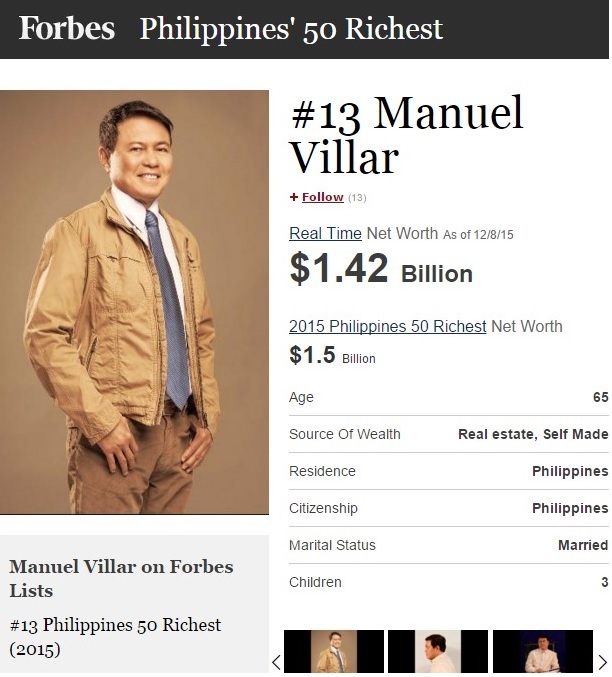 Villar, the only full-blooded Filipino on Forbes’ World’s Billionaire’s list ranked 13th in Forbes’ Philippines’ 50 richest list for 2015. He entered Philippine politics in 1992 as representative of Las Piñas-Muntinlupa, and later became the Speaker of the House and participated in the historic impeachment of former President Joseph Estrada. In 2001, he was elected Senator, and served until 2013. In 2010 he bid for presidency and eventually lost to now President Benigno Aquino III. Let’s go back to today. Today, he seems to be a happy retired politician making his other dreams come true. Based on his actions, he seems not to mind losing the presidential race. Without him noticing, he’s proving his worth and he’s proving that he losing the presidency is not really his loss but the Philippines’ and the Filipinos’. Now, he’s pushing his business empire to compete with the other giants. Honestly, I’m happy for the man although I still regret not having him as our president. But that’s the way it is, majority wins. I wish Mr. Manny Villar many more healthy years so he could teach, mentor and inspire more Filipino entrepreneurs. Sipag at Tiyaga (Diligence and Perseverance), that is what he will always be to me. That is the Manny Villar effect and the legacy he leaves to this country and the Filipinos and guess what, he need not be the president to do that. I can’t imagine what more he could have contributed had he won. P.S. Voting is taking a great risk affecting the whole country. No matter how much we want to choose the good ones instead of just the lesser evils, it just doesn’t happen in reality. Take a calculated risk this coming presidential election.